Just when you thought it was save to go back in the water was the tagline for one of the best water movies ever made: “Jaws” thrilled, delighted and scared audiences across the country in the summer of 1975. Playing to packed, standing room only crowds this landbreaking movie became so popular it was the first film in history to clear the 100 million dollar mark and forever changed the way we look at swimming in the ocean. But it didn’t start out that way. Jaws was based on the bestseller by the same name by Peter Benchley and expectations were high when filming began at Martha’s Vineyard in the spring of 1974. Universal was eager for a hit but it was apparent from the start that things weren’t working out, they weren’t working out at all. Few films are shot in open water. It can become a logistics nightmare and that is just what happened here. Bruce, a 25 foot mechanical shark and “star” of the movie was a let down as it kept breaking down in the salty water and causing numerous delays in production. And it was a nightmare for Steven Spielberg, a then 26-year-old fresh face on the scene. He was untried as he took over as director after the first one dropped out and it was soon clear to him why. Besides the endless delays due to Bruce, the shark, ( Interestingly named after Spielberg’s lawyer) and the unpredictable Atlantic weather, there was an ever evolving script due to rewrites on top of rewrites. This was all adding up. Filming was taking longer than expected. The actors soon grew restless and some even became ill as the demands of filming in the open sea started to take their toll on the human principles as well as the mechanical ones. Everyone was exhausted and bereft of hope as production finally ceased that autumn. A shoot that was supposed to take 10 weeks had ended up taking 23 and was massively over budget to boot. It just goes to show that you never can tell how something will work out in the end. I suppose they were all surprised when the film became so popular that summer. I remember all the hype at the time and how a mechanical shark, a budding great director and the public’s imagination can set box office records. So what happened? Why was a film so wrought with difficulties in its creation become so successful? Most credit the brilliant score by John Williams. The theme song dedicated to the shark and the skilled editing by Vera Fields. These factors contributed a great deal to the film’s success as did Bruce the shark himself. 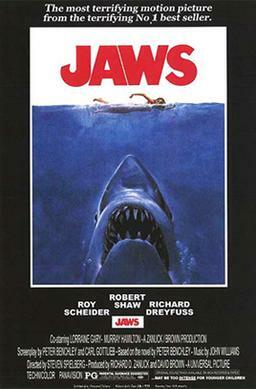 It has been said that the mechanical shark’s many breakdowns forced Spielberg to only include it at the end and that led to the suspense of the movie. Chief Brody the local cop, played by Roy Scheider, a man who’s afraid of water but is bound to duty and to the safety of the people of Amity. Hooper, A privileged shark expert portrayed by Richard Dreyfuss and Quint, the salty shark hater brilliantly performed by Robert Shaw. …and it ends up taking a lot. If you haven’t already, watch this film and find out what happens in the end and if you have seen this film, experience it again and remember why it was so good the first time.